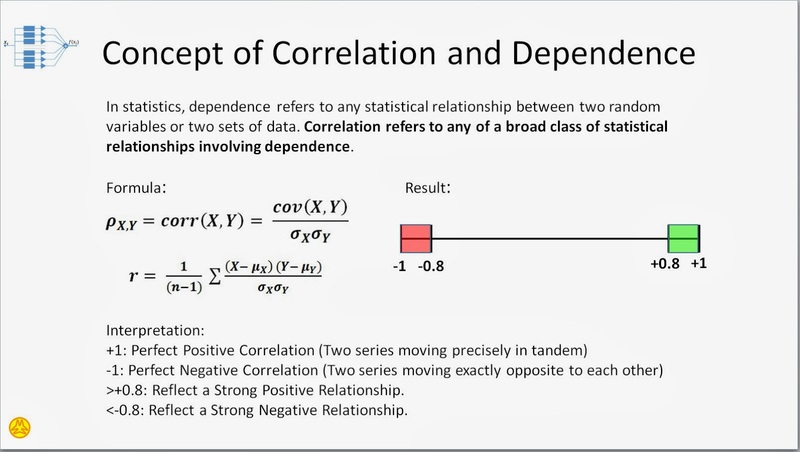 The above slide shows the concept of correlation formula of two set of data. In application wise, it can use for pattern recognition. Such as image or voice recognition, etc. In his latest book, "Cycle Analytics for Traders", John F. Ehlers even uses it to calculate the dominant cycle in the stock chart. So, in broad term, Correlation can be used to find the similar patterns in stock market charts. * Find some current patterns that highly correlated with historical patterns, and use it for prediction that it will follow through in the short future. - Such as head and shoulders, scourers, etc. Well, I suddenly think of posting this article because, just a moment ago, I come across another article - "SCARY PARALLEL" that could be of high interest to others and would like to see how it develops over the next few months. 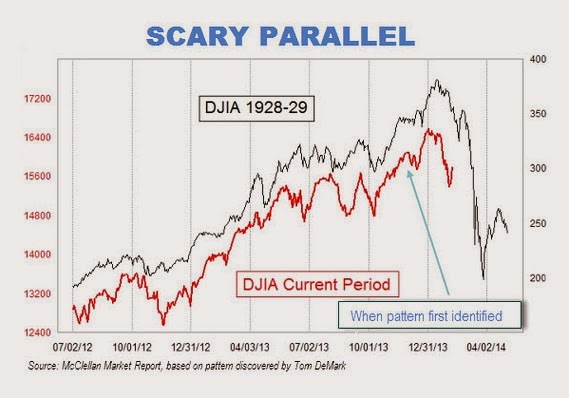 The link of the original article is Here "Scary 1929 market chart gains traction". From the chart patterns, though I don't have the access to the raw data to compute the correlation value, but experience would tell me that the correlation value would surely be higher than 0.8. So, in theory wise, it has the Prediction Value until Proven Wrong! This short video clip is an excellent example of illustrating the concept of pattern recognition - One can only confirm the actual answer after thing happen. In the classical OBV (On-Balance Volume) indicator, it simply takes the idea from traditional tape reading - treat the "up tick" as Buy, "down tick" as Sell, and it assumes no change in price as neutral* (*which is not the case in tape reading). 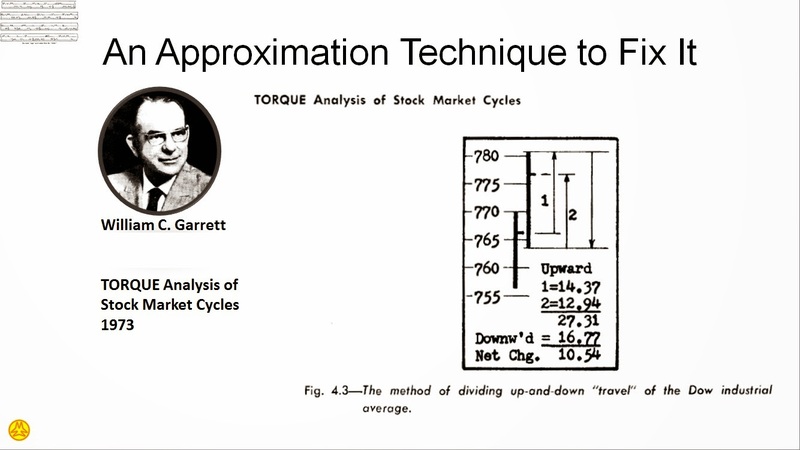 Here is a gentlemen, William C. Garrett, attempted to break down the daily volume into two parts in his book - "Torque Analysis of Stock Market Cycle". And, I think it makes sense. Now a better OBV formula can be written as the cumulative number of (Buy Volume - Sell Volume). It should named as Garrett OBV. And, it can multiply the daily average price to it and named as Garrett Money Flow. The following chart shows the plot of it and the comparison to Classical OBV. There is a proprietary volume indicator known as Time Segmented Volume (TSV). Since it is proprietary, probably the public would not know about the exact formula. But the concept is not difficult. Let say for the Classical way of plotting of OBV, there is no clear sign for both entry and exit. We can then fix a look back period to compare it accumulation/distribution over it's own historical value. 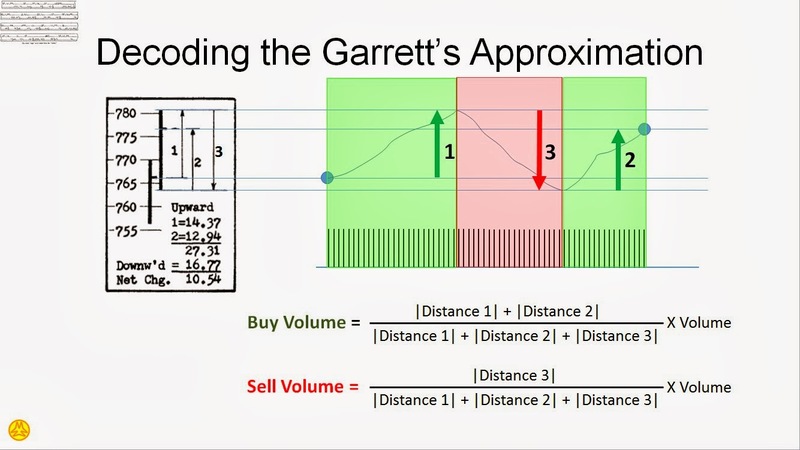 One simple way is to perform a MACD operation on the Garrett Money Flow. Now we can compare the Garrett Money Flow Indicator to the Classic MACD indicator. 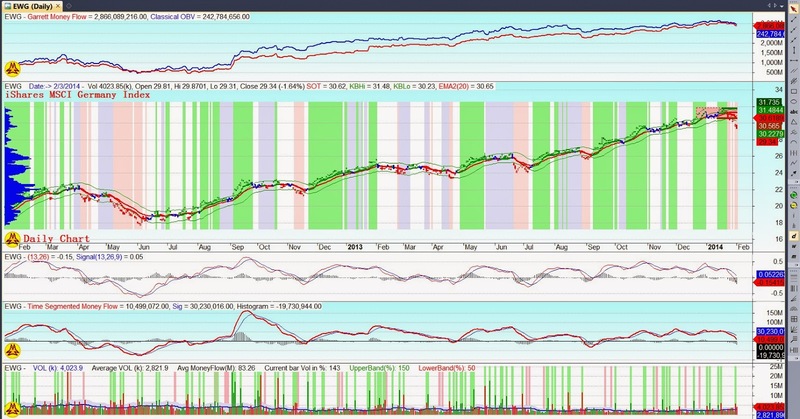 In the above chart, they are using the same look back period for short MA, long MA and Signal. From the chart, there are some very interesting point to take note. Since the Volume Action is taken into account in this new indicator together with price. 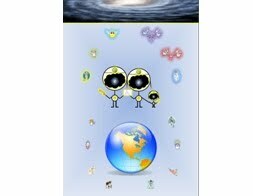 The Time Segmented Money Flow behave differently at couple of place on the above chart. For examples: On March, April and July, the RED Line maintain above the Zero line to prevent any short trades - this happened as a result of more Buying Volume than Selling Volume. When using a indicator as Time Segmented Money Flow, divergence would surely occur on and off. This is where Wyckoff 3rd principle comes into play - "Effort vs Result" that is not matching. Meaning that the cumulation of shares goes in one direction while the price goes another direction. for sure that just ain't so." // : Note: Enhancement to include Opening price as direction.